When you have approved your photo-realistic email proof and made payment, we recommend that you opt for an actual plastic card to be printed and posted to you for final approval before we print your full order. Please enquire for the additional cost. Most customers decide to save the added cost of a postal proof, we find it is mainly larger corporate companies that are ordering a lot of cards who opt a postal proof. It is an actual plastic card which is printed on the same machinery as your full order (it is not a laser or inkjet print out) and it will be 100% identical to how your cards will look in your final order. Optional extras are included such as barcodes or magnetic strips if you have ordered these. This allows you to test them with your machinery to ensure they are compatible. 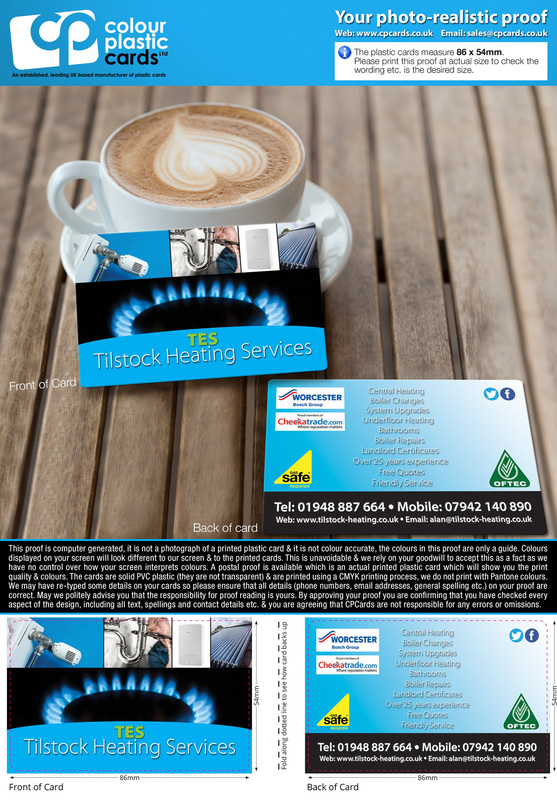 We can post an actual plastic card to you in approx 3 working days. Then, depending on your specification the full order then takes approximately 5 to 6 working days to dispatch. An express service is also available. We want you to be 100% happy before we print your full order, opting for a postal proof ensures this. You can proceed without a postal proof but we then have no way of knowing if your cards are 100% correct for you. You may have had the exact same artwork printed before, with another company/printing process, on a different printing machine onto a different substrate. It needs to be understood that the printed colours WILL differ when printed onto different substrates with different machinery by a different company/printing process. Hence why a postal proof is so useful. You may spent money having your cards designed by a graphic designer and seen their onscreen proofs or inkjet/laser print outs and so you envisage the printed colours to look 'a certain way'. It has to be accepted as a fact that when printed, colours and density of colours WILL differ to how they look on screen, hence why a postal proof is highly recommended. When you have approved the photo-realistic proof that we email to you and made payment, we can then produce an actual plastic card and post it to you for final approval within 3 working days.